Scribd announced on Monday that they have 300,000 reasons for you to sign up with their ebook subscription service. This service, which launched worldwide in early October 2013, has quickly grown to offer the second largest catalog of any of its competitors. Scribd now boasts over 300,000 titles, including everything from best sellers to indie titles from Smashwords as well as ebooks published by HarperCollins, Kensington, Red Wheel/Weiser, Rosetta Books, Sourcebooks, and Workman. The Scribd catalog is now second only to the Kindle Owner's Lending Library, which at 475,000 titles still manages to reign supreme. The KOLL also wins on price (it's bundled into Amazon Prime) but Scribd is more widely available on a number of platforms including web browser, Android, and iOS, and both Amazon and Scribd offer far more titles than their closest competitor, Oyster, which at last report had just over 100,000 titles. 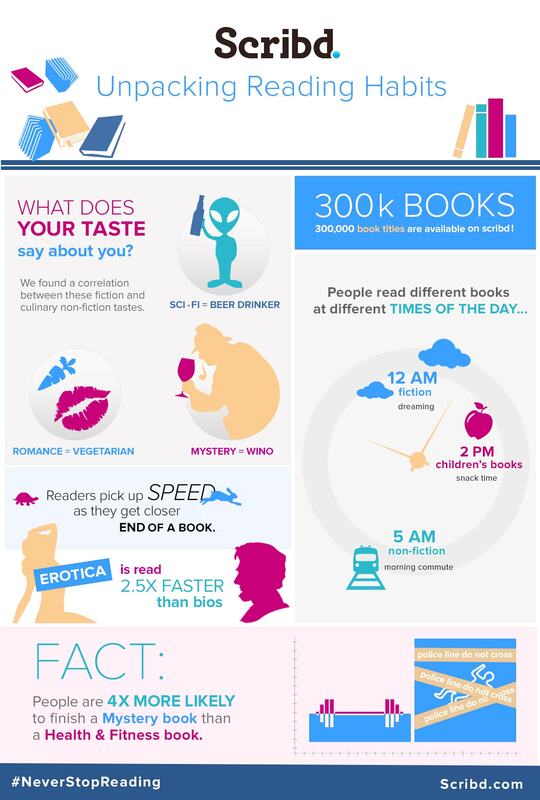 To mark the new milestone, Scribd released a new infographic with a few interesting details about their readers. Enjoy. I use (as a reader and a writer) all three, Amazon, Scribd, and Oyster, and hope to benefit from continuing to use all three, so the following comment is strictly to add on info, not choose sides. “KOLL also wins on price” – but it’s for one book at month; both Oyster & Scribd’s programs are for unlimited titles. “Oyster, which at last report had just over 100,000 titles.” – they’re in the process of adding a substantial number of titles via Smashwords soon also. This isn’t quite right, Scribd is only the 3rd biggest. Our website http://www.forgottenbooks.org has 484473 ebooks, making it bigger than even the Kindle Owner’s Library. Granted we focus on old books rather than the latest releases, so it’s not necessarily the same audience, but as far as pure size goes we are doing pretty well.